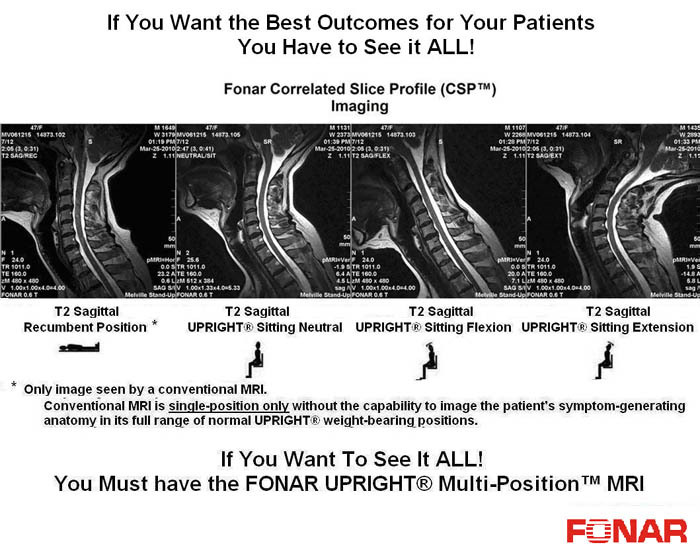 MELVILLE, NEW YORK, July 27, 2011 - FONAR Corporation (NASDAQ-FONR), The Inventor of MR Scanning™, announced it has sold an UPRIGHT® Multi-Position™ MRI to a physician practice of radiologists and neurosurgeons. The UPRIGHT® MRI will be placed in a newly-constructed 50,000 sq. ft. building, increasing the practice to 75,000 sq. ft. for the new state-of-the-art neuroscience spine institute. FONAR was incorporated in 1978, making it the first, oldest and most experienced MRI company in the industry. FONAR introduced the world’s first commercial MRI in 1980, and went public in 1981. Since its inception, nearly 300 recumbent-OPEN MRIs and 150 UPRIGHT® Multi-Position™ MRI scanners have been installed worldwide. FONAR’s stellar product line includes the UPRIGHT® MRI (also known as the STAND-UP® MRI), the only whole-body MRI that performs Position™ imaging (pMRI™) and scans patients in numerous weight-bearing positions, i.e. standing, sitting, in flexion and extension, as well as the conventional lie-down position. The FONAR UPRIGHT® MRI often sees the patient’s problem that other scanners cannot because they are lie-down only. The patient-friendly UPRIGHT® MRI has a near zero claustrophobic rejection rate by patients. As a FONAR customer states, “If the patient is claustrophobic in this scanner, they’ll be claustrophobic in my parking lot.” Approximately 85% of patients are scanned sitting while they watch a 42” flat screen TV. FONAR is headquartered on Long Island, New York. UPRIGHT® and STAND-UP® are registered trademarks and The Inventor of MR Scanning™, Multi-Position™, pMRI™, Dynamic™, Full Range of Motion™, True Flow™, The Proof is in the Picture™, Spondylography™, Spondylometry™ Landscape™, CSP™ and Upright Radiology™ are trademarks of FONAR Corporation.